The theory of gravity in 3+13+1 dimensions famously has black hole solutions, being the limiting configuration of a point mass gravitational source. In higher dimensional gravity, and in particular in higher dimensional supergravity, there are analogous solutions, which however are limiting configurations of a gravitational source that is supported on a line, or a surface, or a higher dimensional space. For a surface one might speak of black membrane solutions hence generally of black brane solutions. Particularly the BPS states among the black branes in supergravity, i.e. those solutions that carry Killing spinors, include configurations that look like the strong-coupling version of the Green-Schwarz super p-branes. The near-horizon geometry of these black branes is generically that of anti de Sitter spacetime times a sphere. To the extent that the worldvolume theory of the branes is a superconformal QFT, this is the origin of the AdS-CFT correspondence. 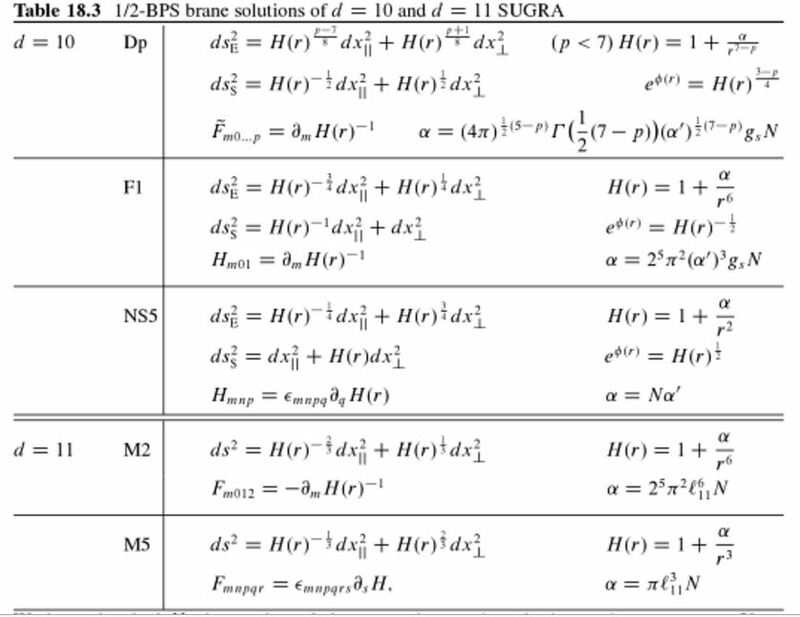 The types of black branes that can occur in theories of supergravity that are obtained from the maximal 11-dimensional supergravity match precisely the types of D-branes and NS-branes that appear in the corresponding perturbative superstring theories. At low string coupling the D-brane/NS-brane description is accurate. Low string coupling implies that the coupling of gravity is weak, hence that the back-reaction of the branes on the background geometry is negligible. At large string coupling but low energy, the effective supergravity description becomes accurate. Here the branes do back-react on the gravitational background and hence create the black brane spacetime geometry. This duality of the brane picture is at the heart of the AdS/CFT correspondence. See there for more details. Last revised on February 3, 2019 at 09:34:10. See the history of this page for a list of all contributions to it.